What’s the Story Behind Forest Park’s Landscape Beds? Every spring, about 70 Forest Park Forever horticulturists, gardeners, seasonal gardeners, interns and volunteers fan out across the Park to plant some 9,100 flowers in 11 annual beds. It’s the fruition of a strategic process that starts in November, after the previous summer’s plantings are covered by fallen leaves and bracing for winter’s chill. That’s when Forest Park Forever’s horticulturists literally draw up their plans for the next summer’s plantings. After the plans are reviewed, edited and reviewed again, plants are ordered from greenhouses across the St. Louis area and beyond. Finally, it’s planting time, and with it, the opportunity for horticulturists in each of the Park’s seven zones to bring their colorful visions to life. But it’s not just a process of choosing what’s available or what will grow best under Missouri’s summer sun. Each bed plays its own part in the various roles the Park serves. For example, in high-traffic areas like the Hampton Avenue roundabout, the World’s Fair Pavilion roundabout and the Park entrance at Forsyth and Skinker Boulevards, the goals this year are color and pop, says Forest Park Forever Horticulturist Hilary Sears. At the World’s Fair Pavilion roundabout, visitors this year will be greeted by beds of dark sweet potato vine surrounded by Tahitian Gold African marigolds. The vine’s rich purple color will contrast with the marigolds’ large yellow poms, while a silver-gray dusty miller border will provide depth. Two gardeners on Sears’ team, Alex Babb and Jake Nelson, helped her plant early one beautiful May morning, along with volunteers Rich Cobb and Harry Wilson. Once the plants have filled out in four weeks or so, Hilary’s team will be responsible for maintenance throughout the summer. Meanwhile on Art Hill, Forest Park Forever Horticulturist Jim Wagner worked toward a different kind of visual effect. During the 1904 World’s Fair, the ridge along the top of Art Hill was home to the formal architecture of the Colonnade of States, with its two restaurants on the ridge’s east and west ends. Today, a shaded and carefully cultivated walkway connects the former restaurant sites, and that’s where you’ll find the ‘terminal beds’ that Wagner’s team is responsible for. Directly across from the Art Museum on either side of the statue of King Louis IX are two other beds that Wagner, his gardeners and volunteers plant and maintain. For the SLAM beds, Wagner designed a complex but carefully balanced geometric planting. Diamonds of white Mystic Illusion dahlias are offset by triangles of purple Fairy Queen salvia. A border of green yews frames the beds, while tropical Chinese fan palms provide height and contrast in the beds’ centers. The tropical theme carries over to the two terminal beds. There, ornamental fountain grass, called Fireworks, and Mexican petunia flank the higher fan palms in the center. Lower-growing pink pentas and yellow Melapodium will provide a splash of color when mature. On the other side of Forest Park, near West Pine and Kingshighway, stands the Jewish Tercentenary Monument. Erected in 1954 to celebrate the 300th anniversary of the arrival of 23 Portuguese Jews in America, it has a bed of blue and white flowers nearby and one at the head of the path leading to it off West Pine. Both Jewish memorial beds and the bed at Steinberg Skating Rink are under the care of Forest Park Forever Horticulturist Susan Van de Riet. 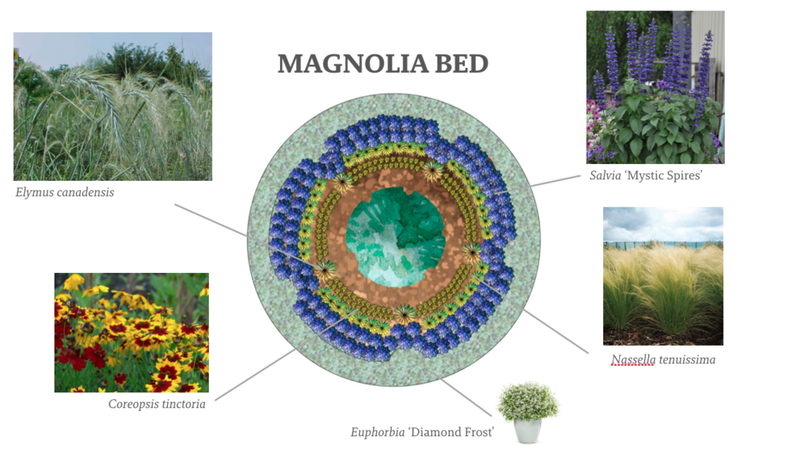 At the West Pine bed, she is especially excited about a display called “The Circle of Life,” inspired by the Walt Disney animated film The Lion King. It is the first theme she has developed for Forest Park Forever, and like all the beds she manages, it reflects her passion: pollinators. Those insects — including native bees, butterflies, moths, beetles, flies and even wasps — play important roles in Forest Park’s ecosystem, Van de Riet explains, further echoing the “Circle of Life” theme. At both the West Pine and Steinberg beds, she selects as many native plants as possible to draw and support native pollinators. Of course, for the Forest Park Forever team, a lot of work lies ahead before summer again turns to fall and the Park’s circle of life begins again. But that doesn’t bother Van de Riet. “I’m already thinking about what ideas I’ll come up with for next year,” she says. Tim Fox is Principal at the Write Fox LLC and co-author of From the Palaces to the Pike: Visions of the 1904 World’s Fair. He lives with his family in the Southampton neighborhood.